Many people don’t realize that once all your teeth extracted, your jawbone senses that it isn’t needed any more, and your body begins to dissolve away that bone in order to use the minerals elsewhere in your body. 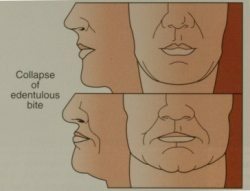 This jaw shrinkage is called Facial Collapse, and it takes about ten or twenty years to occur. This picture shows the progression of facial collapse. It is taken from the textbook, Dental Implant Prosthetics by Dr. Carl E. Misch. In the top model, the teeth are all present. 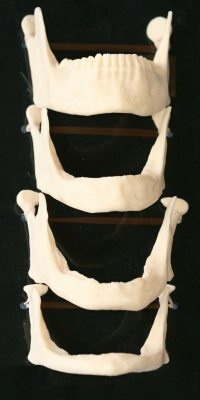 As time passes, the jaw changes as shown, until after about ten or twenty years it looks like the model at the bottom. When a patient has a jawbone that looks like this lowest model, their face looks shriveled, and they will find it very difficult to wear a conventional removable denture. The problem is that when there is such a short ridge of bone left, the tongue and the cheeks will attach close to the crest of that bone, leaving no stable surface on which to rest the denture. Almost all the tissue is movable tissue, so the denture will move around with the tongue and cheeks. And, with little stable surface to rest the denture on, that surface has to bear all the pressure of the teeth, so it becomes sore, even painful to wear the denture. The effect is more serious in the lower jaw for a couple of reasons. First, you have the tongue attached on one side and the cheeks on the other, leaving only the thin ridge of bone on which the denture can rest, and making it so the denture will move around a lot. Second, that bony ridge often becomes so thin that it is actually sharp, leading to painful sores when the patient wears the denture. The patient has become a dental cripple. On the right is an illustration of the effect of facial collapse on the patient’s appearance. The distance between the nose and the mouth shrinks, as well as the distance between the mouth and the chin. The lips begin to pucker more because the upper and lower jaws are closer together. All of this causes the face to appear more shriveled, with deep creases. The face definitely ages rapidly. Remember, that it only takes about ten years for these changes to become serious. Once all the teeth are extracted, the bone loss will begin. Unfortunately, placing removable dentures actually accelerates the bone loss, because of the pressure on the bone by the dentures. The placement of dental implants not only will anchor the teeth so that wearing teeth becomes possible and even comfortable, it also prevents bone resorption. Each dental implant sends a signal to the bone that Dr. Misch calls a piezoelectric signal. The bone around each implant will be stabilized. The more dental implants you have placed, the more bone will be retained. It is by far better to intercept this process before it occurs by having dental implants placed soon after teeth are extracted. But if you are already a dental cripple because of facial collapse, you can still be helped. In the hands of a skillful surgeon and restorative dentist your jawbone can be rebuilt and you can enjoy eating once more. The process is expensive and can be lengthy, but it is definitely worth it. Here are some points I’d like to mention about this rebuilding process. Bone grafting – A surgeon can build up the bone you have lost using bone products or bone from your own hip. Denture/Implant Hybrid restoration – An implant hybrid uses dental restorative materials to replace lost bone and gum tissue. This will increase the dimensions between your jaws and help fill out your face. Precise placement of dental implants – When you don’t have much bone left, it becomes even more important than usual to have the fixtures placed precisesly, using careful three-dimensional x-ray techniques (CAT scans) combined with careful analysis and planning. Be sure you’re in the hands of an experienced implant team. 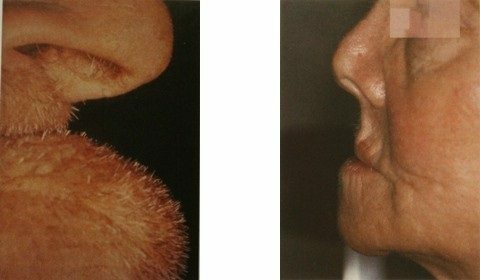 On the right we have two photographs of actual patients illustrating facial collapse. Notice the shortened distance between the nose and chin, the shriveled appearance of their faces, and see how the upper lip appears to be sunken in each case. If their mouths were properly restored, they would not only be able to eat properly, but they would look much younger. If you would like to be referred to an expert cosmetic dentist who would be able to help you with problems like facial collapse, please see our cosmetic dentist referral page.